Update: When I got back to a computer and checked the post, I found that it looked fine. The application worked just as it stated. But I just had to fix some of the typos, wording errors, and add a link. My writing is bad enough without all the extra damage the little keyboard and my big thumbs were doing to the English language. Note: This post is being created from my Blackberry Storm. Oh how I miss spellcheck right now. I found an application on the Blackberry online store that says it is for “mobile blogging”. It is called CellSpin and it is free – you just got to love that price! The download and setup was quick and easy. The application allows you to post pictures, video, and audio directly to your blog or other social sites. Text editing is a challenge on a Blackberry Storm, as moving back and forth in text is just plain hard. I never thought I would say that I miss the scroll wheel. This is one feature of the Blackberry Curve that I miss so very much. The text navigation problems of a Storm will reduce my desire to write “on the run”. It is not a short fall in the application, but with the device. The lack of a spellcheck solution is a shortfall of the program. As you can see by now, I have a hard time spelling kat without a spellcheck program. Is mobile blogging useful? Sure, for the right type of blog. 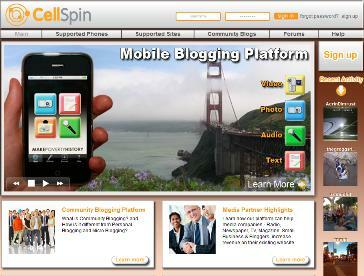 CellSpin allows for postings to multiple sites, which I found impressive. I can see this being very popular for Facebook and Myspace users. They can snap some video or picture and post it in seconds with the appropriate commentary. That is a very cool feature. But I must say that it has more limited application when you leave the social site arena, unless you are very good at writing on your mobile device. I am not, so I will have to give up on mobile blogging or get an fold-up keyboard for my Storm.